I was the "new kid on the block". And my arrival was a shock. And even the brown skinned ones too. Yet you took to me like glue. We fitted together like peas in a pod. My rough exterior against your warm, soft sole. An indelible mark that would not go. It felt like you were there. Your ways; plays and even how your most intricate hair sways. Deep in the fabric of my skin. Places only you have been. And even in the darkest of nights, you'd find me. Your appendages, eagerly seeking me out until they embraced me. And I thought they were wrong and mistaken. When my health suddenly started failing. And the next we were flat on our backs. That was able to do what I could not do. Doomed to watch you fit into something else besides my head. Fitting into it so perfectly. A useless, cut, bathroom slipper. Hidden from the world; under the bed. And I am filled with jealousy and hate. For I remember that I already know his fate. Ronke O’tega has always referred to herself as a writer. Yet she recently discovered her great strength in performance poetry. She has been writing for as long as she can remember and she hopes to keep writing throughout her life. She writes a bit on all the genres and also likes to call herself a creative junkie. A lot of different things inspire her work. 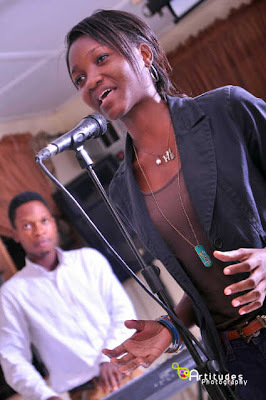 She is currently a final year student in the Department of Communication and Language Arts at the University of Ibadan.